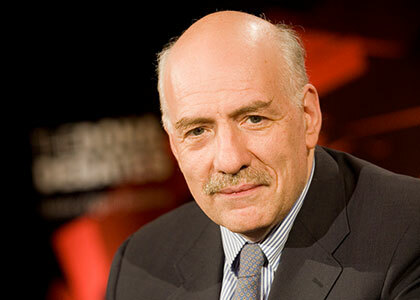 Tim Sebastian is Chairman of The New Arab Debates, currently broadcast and distributed world-wide on Deutsche Welle TV. He previously founded The Doha Debates which have been broadcast continuously on BBC World since 2004. Sebastian also presented HARDtalk, the BBC’s renowned daily half-hour interview programme. For HARDtalk, he traveled to many countries around the world including Germany, Hong Kong, Japan, Middle East and the USA, interviewing presidents, prime ministers and kings, as well as authors, actors and musicians. He also presented the Outsider Debates (2012), recorded in India and screened on Bloomberg TV. Sebastian received the Royal Television Society’s “Interviewer of the Year” Award in 2000 and 2001, and won the “Richard Dimbleby Award” at BAFTA and was also named “Television Journalist of the Year” by the Royal Television Society. A best-selling author, he has written eight novels and two non-fiction books. He has written widely for newspapers including the Mail on Sunday, The Sunday Times and the New York Times. He also chairs conferences and seminars, and has a wealth of experience hosting events and award ceremonies, both at home and abroad. Sebastian holds a BA Honours degree in modern languages from Oxford University and speaks Russian and German. He began his career as a foreign correspondent in Warsaw, covering the Solidarity revolution, before becoming the BBC’s Europe Correspondent in 1982 and Moscow Correspondent in 1984. A year later he was expelled by the Soviet authorities and sent to Washington until 1989. In 2015 he was elected a Fellow Commoner at Corpus Christi College, Cambridge to serve during the academic year 2015-16.